In September there will be a gallery exhibit entitled Black Kirby at Jackson State University in Mississippi and here are a couple of samples. I like what I'm seeing. 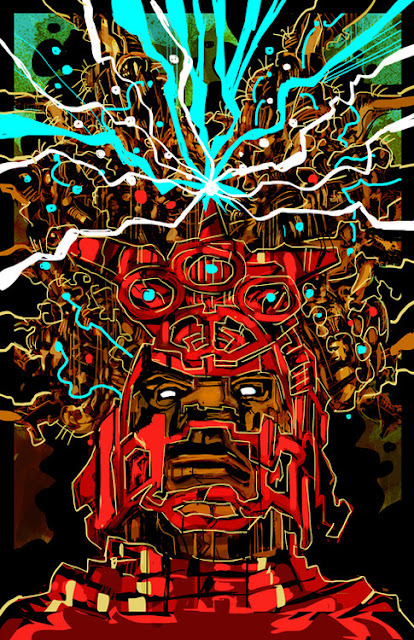 Artists John Jennings and Stacy Robinson are definitely channeling some Jack Kirby energy into their work. The piece entitled Totem Oba has so much intricate detail layered on top of that energy that I almost felt I was looking at a newfound collaboration between Jack Kirby and Philippe Druillet. The Black Kirby show will be housed in the JSU Liberal Arts Building and will feature about fifty works of art. You can see a slideshow of eight of the pieces over here and you can read a little bit more over here. Earlier this week, the Hero Initiative honored the occasion of the 95th anniversary of Jack Kirby's birthday by inviting one hundred artists to Wake Up and Draw anything they wanted. A majority of the artists drew their version of some Kirby character (and of course there are so many to choose from!). Newsarama printed about half of the drawings over here, and you can find the full contingent on twitter over here. Last week I showed you my drawing of Virman Vundabar. Now I'm ready to show you my Jack Kirby drawing of the same character. 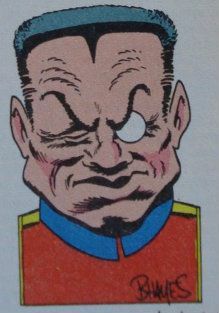 The image above appeared in 1987's Who's Who: The Definitive Directory of the DC Universe #25. You can see a larger version over here. The artwork is by Jack Kirby and Steve Rude, but I can't say it's a "Jack Kirby original" because Mr. K never had in his hands this art board that I own. Rather, Mr. Kirby did his penciling on a different board and then Steve Rude inked it onto his own board using a lightbox. It's entirely possible that the Jack Kirby original artwork to this day exists in pencil form and is in the hands of another collector. 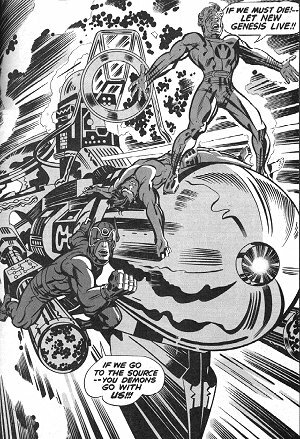 I will still say, though, that this is "my Jack Kirby and Steve Rude drawing of Virman Vundabar." So there. Recently I wrote about Showcase Presents Showcase and there's one more thing I want to convey about the venerable Showcase series at this time. It introduced itself to its readers at the beginning of its first issue! Rather than a splash page for the Fireman Farrell story, the editors devoted the prime location of page 1 to explaining the idea of Showcase to the readers. I have been a comics fan for about umptyleven years but I never saw that very cool introductory page until Showcase Presents Showcase was released. The fourth issue of Showcase was, after all, responsible for ushering in the much-beloved Silver Age of Comics and I'm just trying to do my part to help more fans know about the above great page. You can find a larger image of the beautifully computer colored one-page story over here, and you might find more of interest in the Dial B For Blog Showcase article where I stumbled upon the artwork. Larry Tye appeared recently on Chicago Tonight, a one-hour nightly news program that has run for many years on Chicago public television channel WTTW. With seconds-long sports and weather coverage allowing for long-form news and features stories, Chicago Tonight is the only news show I watch on television. Larry Tye has written Superman, The High-Flying History of America's Most Enduring Hero. The writer's claim that Superman is Jewish is just one of his interesting assertions. You can watch the interview with Larry Tye over here. I never saw one issue and I had never even heard of it before yesterday, but it seems that Comic Foundry was a pretty good magazine about comic books. It lasted four issues in and around 2008, and then it was gone. Neal Adams told readers how to be a successful artist. Mike Gold told what went on behind the scenes in 1988 with Action Comics Weekly. Allan Heinberg talked about his Young Avengers title. Klaus Janson gave the "ultimate" interview about inking. Joe Quesada described his job as editor-in-chief of Marvel Comics. I have merely scratched the tip of the iceberg here. You can read these articles and see the full archive list over here. Above is one of my favorite photographs of all time. The story of Wild Bill Gelbke and his massive Road Dog motorcycle is legendary in Wisconsin and you can read about them over here. I saw The Dark Knight Rises yesterday and director Christopher Nolan's Bat Cycle always reminds me of the Road Dog. I was surprised at how much sooner Dark Knight went into second release compared to The Avengers, months sooner it seems. I usually wait to see movies until they reopen at my neighborhood, one-screen second-release house. I've been going to The Patio since I was a kid, and yesterday I walked over there to see The Dark Knight Rises. I feel this is the weakest link in the Christopher Nolan trilogy. The Heath Ledger Joker would be tough for any actor and/or villain to follow (and I never thought much of the Bane character since his 1990s debut anyway). I did, however, very much like the inclusion of the umasked and unnamed Cilliam Murphy Scarecrow character serving as the "judge" in the "court" scene late in the film. Though flawed the movie was still enjoyable, and far superior to The Avengers (which I saw a month or two ago, also at The Patio). The Avengers and Thor and Iron Man all strike me as children's movies with their videogame palettes and their throbbing hiphop scores. On the other hand, I at all times feel like an adult when I'm sitting in the theater watching a Christopher Nolan film. It must be possible to make an excellent comic book film that does not feature Batman, but I'm still waiting. Brian Hayes Inks Jack Kirby! Well, I had to join the party. 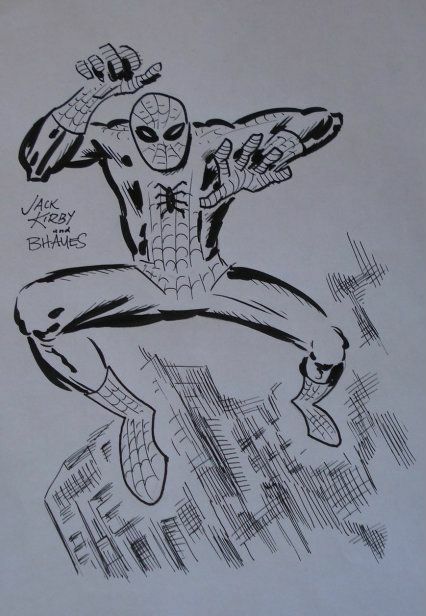 Over the past week I've shown you the different ways a 1970s Jack Kirby Spider-Man drawing has been inked by Frank Miller and Mike Royer and John Byrne. I like all three of those interpretations but I felt the need to throw my own hat into the ring! You can see a larger version of my spin over here and, as I wrote previously, you will hear about it right here on The Hayfamzone Blog if any more renderings of this same drawing surface on the internet. Get this into your tiny brain: trade paperbacks are not the “future” of this industry. They are another industry entirely, as movies are to TV. And, like movies, they are going to become increasingly dependent upon new material as the prima donnas who work in comics these days increasingly demonstrate themselves incapable of producing their product on schedule—even schedules which, as in this instance, they have set themselves! Go on—continue congratulating these unprofessional elitists for their failures. Pretty soon there will be nothing but trades—and then, without reprint material to fill them up, those will start coming out later and later and later. Isn't the last quote above pretty much describing what DC Comics would do when they rolled out their New 52 initiative seven years after Mr. Byrne made that statement? You can read the full page of Byrne quotes over here, but be warned that just about every other one on that page features saltier language than shown above. Back in my days of writing letters to the editors of comics, I was very strategic. Rather than sending in to the comics that I felt most strongly about, I focused on the titles that received the fewest letters. I wanted to maximize the probability of my composition getting published! In the 1980s, The Omega Men at DC Comics suffered from a fairly empty mailbag. I decided to do something about that. I not only wrote a letter but also sent in a drawing of the Jack Kirby Fourth World character Virman Vundabar. There must have been a connection that is no longer clear in my mind (maybe V.V. was appearing in the then-current storyline?). Anyway, the above drawing by me was colored by DC and saw print on the letters page of The Omega Men #29, cover dated August 1985. 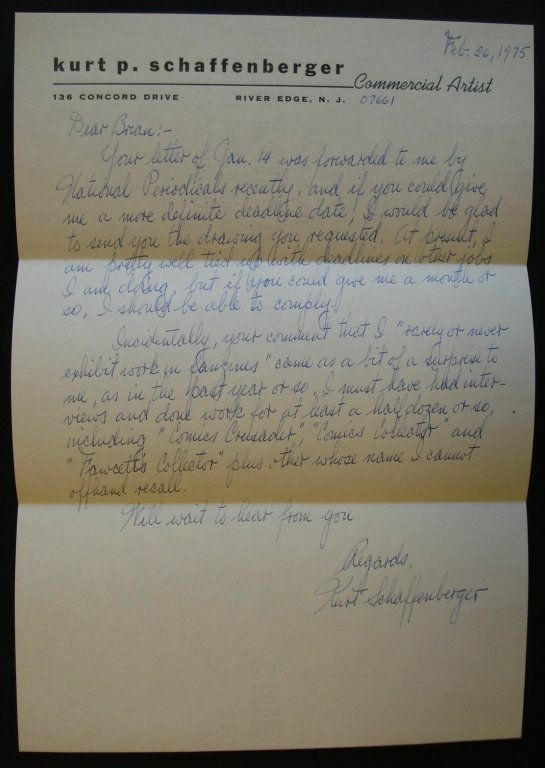 Down here is the letter I wrote to Omega Men editor Alan Gold and which saw print adjacent to the Virman V. drawing. Has my writing style changed in 27 years? Everybody's inking Jack Kirby's Spider-Man! Let's put this into temporal perspective. 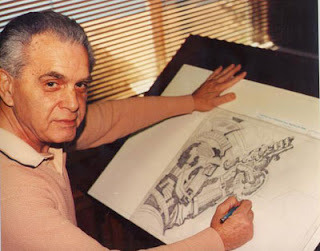 Jack Kirby pencilled the drawing in the 1970s. Mike Royer inked it in 2000. Frank Miller inked it in a very experimental way earlier this year. And John Byrne inked it this week in response to Miller's "out-there" version; the Byrne interpretation is pictured above. If I come across any other ink renderings of this image I will definitely share them with you. 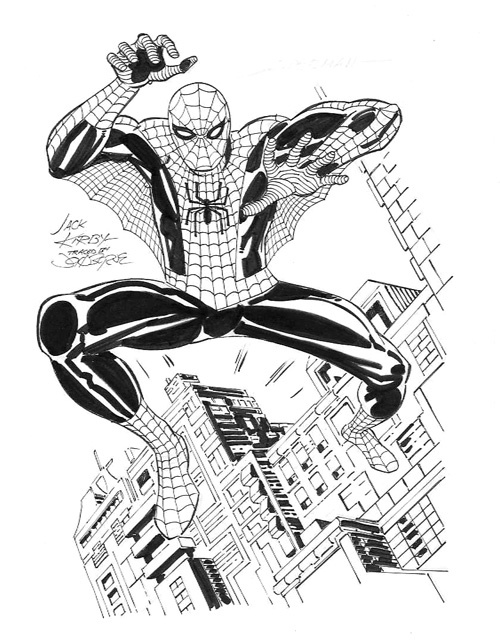 I think it's fun to see Mike Royer's version of inking the same Jack Kirby Spider-Man drawing that I showed Frank Miller's version of yesterday. I find it fascinating to see how different inkers approach the same image. Have you seen this drawing before? I got my first glimpse of it today. Jack Kirby's New Gods Are Returning! In issue 12 of the New 52 version of Wonder Woman, writer Brian Azzarello establishes a linkage between the gods of the Wonder Woman mythos and Jack Kirby's New Gods! The exact nature of the connection is not made entirely clear, but the last page of this story is something that no fan of Jack Kirby's Fourth World would want to miss. If you'd like to read more about what the writer has in mind before you read the issue for yourself you can ignore this SPOILER WARNING and just click right here. Possibly the most popular article ever to appear in The Hayfamzone Blog is the one entitled "I Hate Comiclink." First published in March of 2011, it has garnered more published comments than any other Hfz article. Maybe you want to take another look at that story over here. Well, guess what? I've come up with a new reason for us to hate Comiclink! I just found out that they also sell original artwork by consignment. As if they weren't already raking in enough cash by anonymously selling all those slabbed comic books, you can also anonymously buy premium artwork from them and help them fill their coffers with a hefty commission charge. Yes, they do offer some fabulous artwork (like a 1948 Joe Kubert Hawkman page that I am (sniff) no longer able to show you). You can find out more about their art auctions over here. 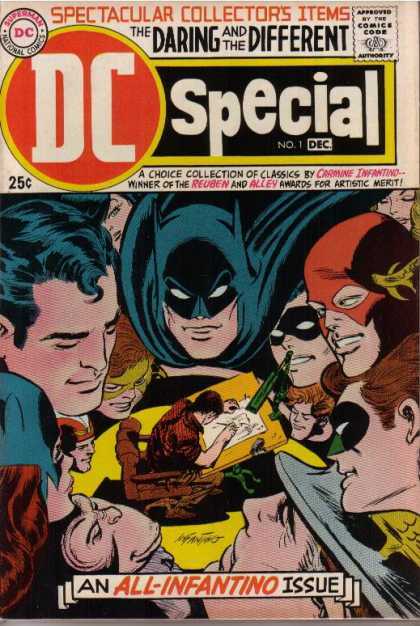 Carmine Infantino is, of course, a legendary figure in the world of comic books. After getting his start drawing in the 1940s, Mr. Infantino made a big wave by drawing the 1956 revival of The Flash in Showcase #4 which is fairly universally regarded as the beginning of the Silver Age of comics. From the mid 1960s to the mid 1970s he served as the Editorial Director then Publisher of DC Comics (and so it was on his watch that Jack Kirby migrated to DC from Marvel and created his Fourth World comics). Then Mr. I settled back into drawing comics for another decade or so. It's difficult to dispute that Carmine Infantino has had a wonderful career in comics. But do you know his younger brother also drew comic books? That's right! Before yesterday I had never heard of Jim Infantino, but then I read this paragraph about him in the Lambiek Comiclopedia. To learn more I consulted the Grand Comics Database, which lists exactly seven stories drawn by Jim Infantino between 1949 and 1956. There are westerns and horror stories in the list, mostly done for Marvel/Atlas Comics. The GCD list is incomplete, though, because it does not include one or two titles that are mentioned in the Comiclopedia entry. Whoops! Fasten your seatbelt! Memory realignment in progress! Now I realize that I did hear of Jim Infantino before yesterday, because I remember reading this article by Harry Mendryk when it was first published in his Simon and Kirby Blog three years ago. Harry wrote in that article that Jim I. was a studio assistant to Joe Simon and Jack Kirby and a vintage photo is displayed with Jim I. flanked by Jack Kirby and Ben Oda. 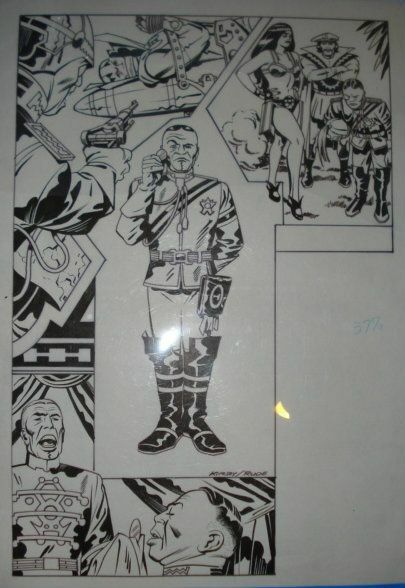 Here is one sample of Jim Infantino artwork so you can add it to your database. You can see that the artwork above is signed by both Jack Kirby and Roz Kirby. Robert Steibel has posted this drawing and written a paragraph praising it over here. 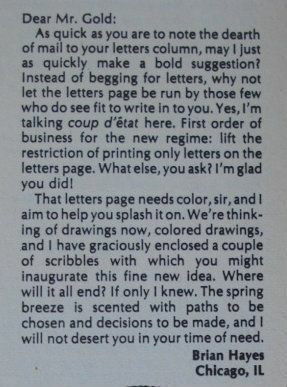 Mark Evanier on his blog then weighed in on the drawing, writing that he believes most of the inking on this particular page was by Mr. Kirby himself. Mark's point is that Mrs. Kirby's inking was generally limited to tracing over the pencil lines with a pen. Or, when the Mrs. did ink with a brush it was very, very rudimentary brushwork, more basic than what is evident on this page. What Mark wrote is over here for you to read in greater detail. I found this used matchbook on the ground when I was walking home from school one day in the early 1970s. Yes, I saved something I found in the street for forty years. That's what I do. The Amazing World of Superman opened in Metropolis, Illinois in 1972. It was a museum dedicated to Superman but, for various reasons, it closed after just one year. Hmmm, another source says says the endeavor ran out of funds before construction ever began. I just don't know whom to believe. Something that definitely does exist, though, is the 68-page tabloid-sized The Amazing World of Superman, Metropolis Edition. Every collector interested in Superman should own this nice comic book featuring a story by Curt Swan and Murphy Anderson among its many features. Here, I'll try to help you find a copy on ebay. Maybe you even want one of the matchbooks for your collection. Wait, you're just in time for the happy ending! There is a Superman museum in Metropolis after all! Called The Super Museum, it opened in 1993 and you can read about it and see some photos over here. In the meantime, here's the inside of my used matchbook. A week or so ago, I started a rebelmouse account. I had never heard of that website and didn't know what it was, but I signed up. How could it hurt, I figured, and maybe this will turn out to be a good thing (whatever it is). Sometimes you just get lucky. I have learned what it is and, far better then merely good, rebelmouse is EXCELLENT! It turns out that rebelmouse is an aggregator. (You can read a business page article with specifics about it over here.) It collects web pages and presents them in an organized fashion. I already told you about my previous experience with the Scoop It: Jack Kirby aggregator which collects and re-presents any article I (or others) write having to do with Jack Kirby. Rebelmouse collects all of my Hayfamzone Blog articles, regardless of their subject matter, and presents them in a newsletter format. I like the look very much! I've mentioned before that I send out a tweet on twitter every time I post a new blog article. Well, rebelmouse incorporates my tweet as the headline of the item on the rebelmouse/hayfamzone page. The aggregator even includes items that I have looked at but did not produce. You may find yourself liking it so much that you wind up using rebelmouse as your main portal to the hayfamzone. Don't wait another second! See what you think about it over at www.rebelmouse.com/hayfamzone. 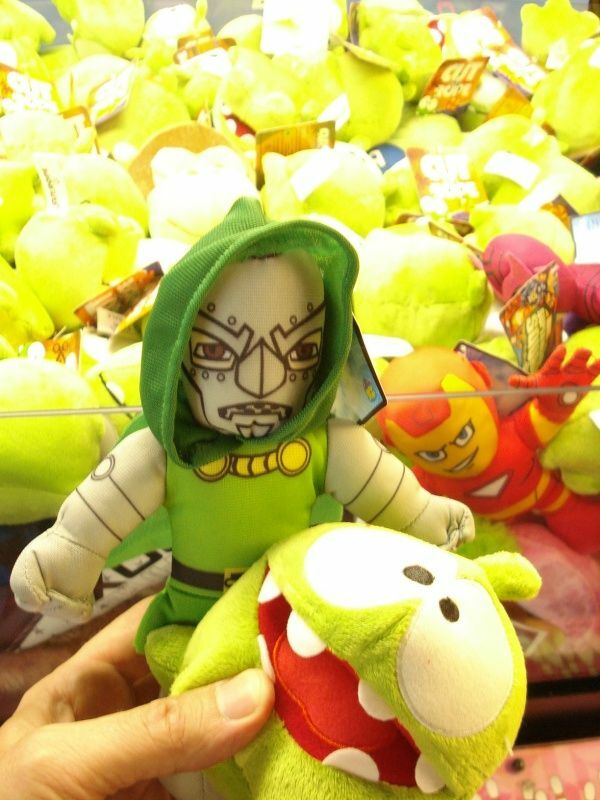 Doctor Doom Never Had a Chance Against Me! Look at Captain America taunting me in this arcade grabber game. The playing field population is mostly comprised of round greenish creatures (from Toy Story, I think), but there's also a Doctor Doom and a Hawkeye and an Iron Man. This machine is in the game room of my friendly, neighborhood bowling alley. Brunswick Zone in River Grove, Illinois has a great deal for the summer in which for $9.99 they let me bowl as much as I want in two hours plus they give me a personal pizza and a pop. I did buy myself a new bowling ball last month so I've been partaking of this deal most weekdays for the last two weeks. Also with the deal comes twelve game room tokens. If there were any pinball machines I would have felt a gravitational pull toward them but instead I was drawn to the Marvel character stuffed dolls in the grabber game. Each play costs four tokens and the game is over after one grab (whether it was a successful grab or not). 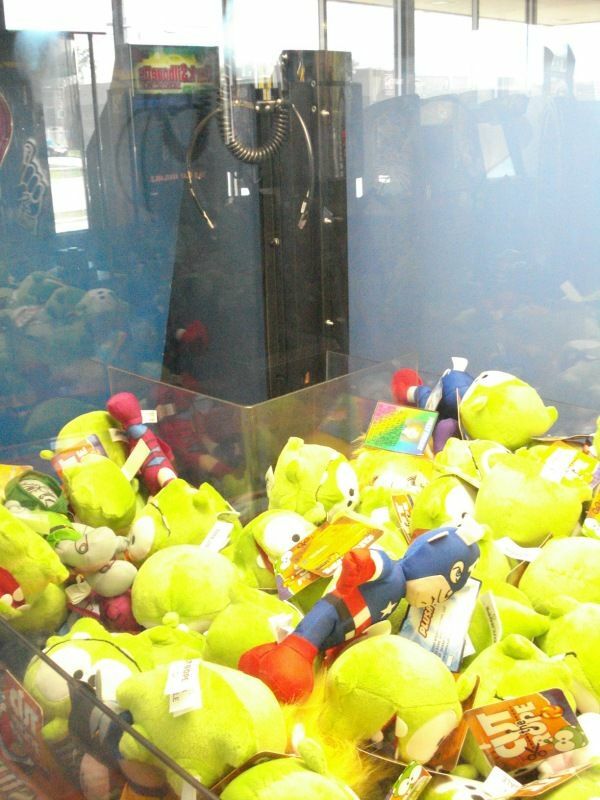 So many times I was able to pick up one of the Marvel characters only to have it slip out of the grabber's claw on the journey over to the Treasure Drop. The key to success, I figured out, was to grab for two dolls at once and then they don't slip out afterwards. That's right, I won! Look for yourself down here at my trophies. Jeanette found this page which displays all of the above Batman symbols. 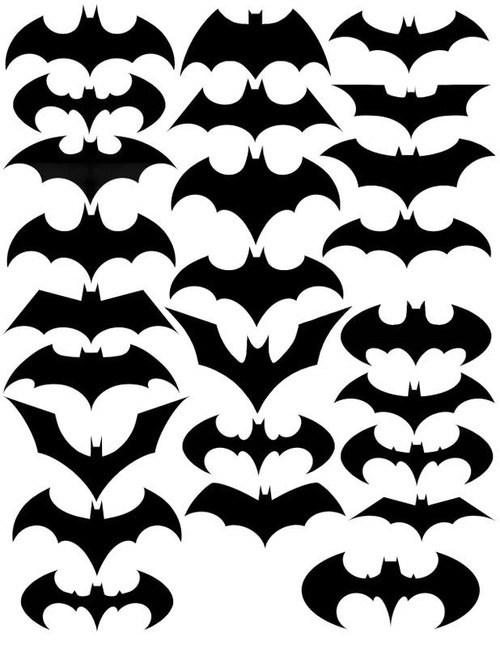 But as soon as I saw all of those my mind started percolating about still other Bat symbols that were not included there, and I started digging. I came across this page posted by a logo designer in Malaysia, which included a number of other Bat symbols. Even after that, in my mind a piece of the puzzle was yet missing. I investigated a bit more and found the Bat symbol that Frank Miller used in his 1986 Dark Knight story; it appears below and its rectangular boldness makes it my favorite Batman symbol of them all. An interview with Chicago resident Brian Azarello is the front-page feature of the Arts + Entertainment section of today's Chicago Tribune, heralded by a presidential-portrait-sized headshot that fills fully half of the newspaper page. It's only appropriate that a Chicago newspaper would feature a local craftsman so prominently. Azarello is accumulating some acclaim for his New 52 relaunch of Wonder Woman, and the article covers that and his other accomplishments well. Here is a link to the online version of the interview which, unfortunately, is just one-third the length of the full version in the paper. Though unstated, the publishing of the article is synchronized with the first day of this year's WizardWorld/Chicago Comicon, which might be viewed as ironic since one of Jill Thompson's tweets a month or so ago announced that they would not be attending that convention. Wait! I should have mentioned first that Brian Azzarello and Jill Thompson are married. By the way, have I written before that my first year of teaching was at Jill Thompson's high school? Jill was in the other geometry teacher's class so she was not my student, but her friend Marguerite was in my class. This was back when I was drawing for Alan Light's Buyer's Guide for Comic Fandom and one day I brought a page or two of my artwork in to school to show my students. After school that day Marguerite brought comics fan and budding artist Jill to my room so she could see my pages also. Jill was around then getting involved with fanzines and created Banana Man and, not too many years later, she was drawing Wonder Woman. Yes, the same WW that her husband now is the writer of. Did you ever notice that everything is connected? 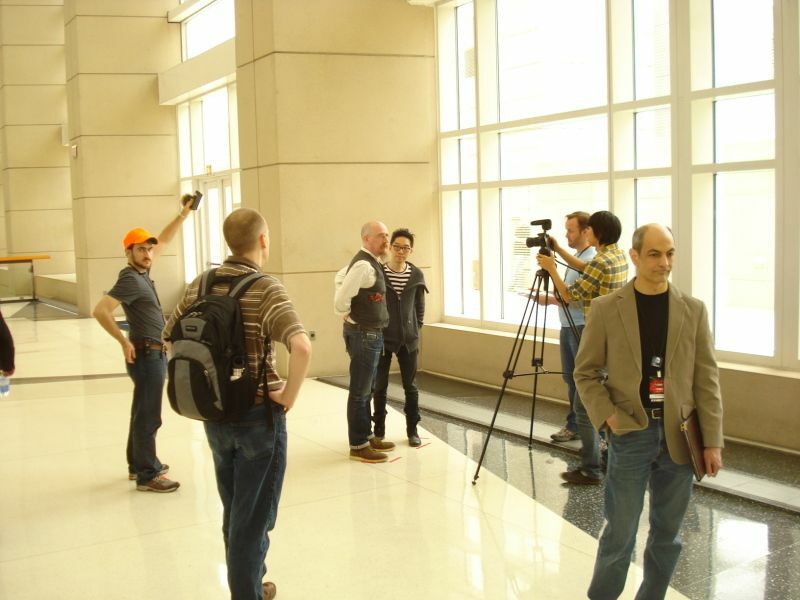 Down below is a picture I took of Brian Azzarello being photographed at this past spring's C2E2 convention. Have you heard anything about Watchmen this year? 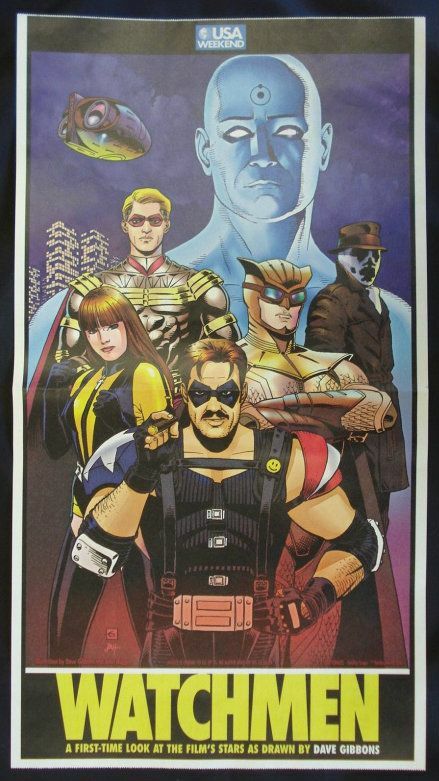 Back in 2009 when the Watchmen movie was released, Dave Gibbons drew a promotional poster for USA Weekend featuring the likenesses of the film's actors as they appeared in costume on screen. Here is a USA Weekend interview with Mr. Gibbons and the article boasts of the great poster but, unfortunately, their link to it has grown stale. Never fear! The hayfamzone is your clearinghouse for all things comics-related. Direct to you from deep within the Hayfamzone Vault, the unusual poster I'm writing of appears above (and, somewhat larger, over here). To serve as icing on our blood-stained cake, how about a photo of a youthful Alan Moore and Mr. Gibbons? The Forever People and Mister Miracle and The New Gods and Superman's Pal, Jimmy Olsen collectively came to be known as Jack Kirby's Fourth World back in the 1970s when Mr. Kirby was at their helm. Those series are some of my all-time favorites in the vast history of comic books; I told you back here that The Forever People #1 gets full credit for me developing into an insatiable fan of the artform and over here you can read more about the re-drawing of the cover of that comic that I commissioned from the inimitable Fred Hembeck. Starting a few days ago, the guys and gals on twitter decided to have a little fun. Somebody started a twitter-feed based on the hashtag #FourthWorldProblems and tweeters are writing jokes based on these Jack Kirby creations! You think you've met a nice gal and it turns out she's a member of the Female Furies. My Mother Box keeps nagging me to clean my room before I can vanquish the parademons. Finding gloves with square fingertips is hard. My kid failed math because he couldn't solve the Anti-Life Equation. Even if you haven't signed up for twitter yet you should be able to view the entire twitter-feed when you click here. The top-billed guest at the convention is artist Renae De Liz who has drawn comics for IDW. Writers Greg Rucka and Gail Simone and Jen Van Meter round out the list of comics-related guests, but comics appear to be a low-on-the-totem-pole focus here (as with Geek Magazine like I wrote about last week). Most of the guests seem to be from other media like television or gaming. I am all in favor of girls and boys and men and women and everybody being fans of comics books. 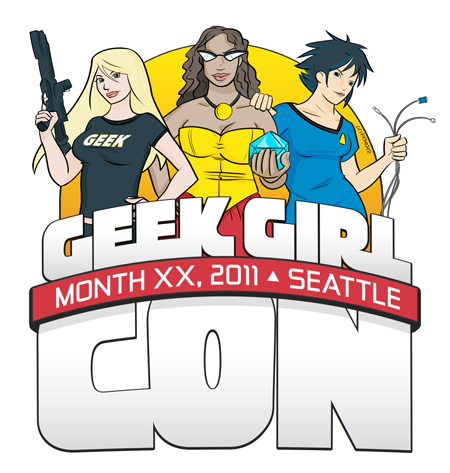 If Geek Girl Con is a fun time and gets people more interested in comics and related pursuits, I'm on board. But I couldn't help where my mind wandered to. As I first read the GGC home page where the front-and-center first three paragraphs encourage attendees to plan ahead for the convention and to wear comfortable clothing and to go ahead and dress up in a costume, I can't be held responsible for what occurred to me. Their website isn't trumpeting their Special Guests of Honor, I asked myself? I'm ready to accept the lashing that will come with admitting it, but I immediately thought of the classic Saturday Night Live commercial parody known as Chess for Girls. (By the way, I like how last year's GGC logo included a little artwork, as seen below.) 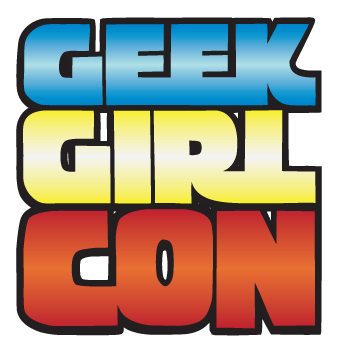 You can get full details about this year's Geek Girl Con at www.geekgirlcon.com. I have already told you back here that I commissioned the great artist Kurt Schaffenberger to draw a full-page Captain Marvel for me. But I never did share with you the very polite note he sent me before he did the drawing. The time for that sharing has come. 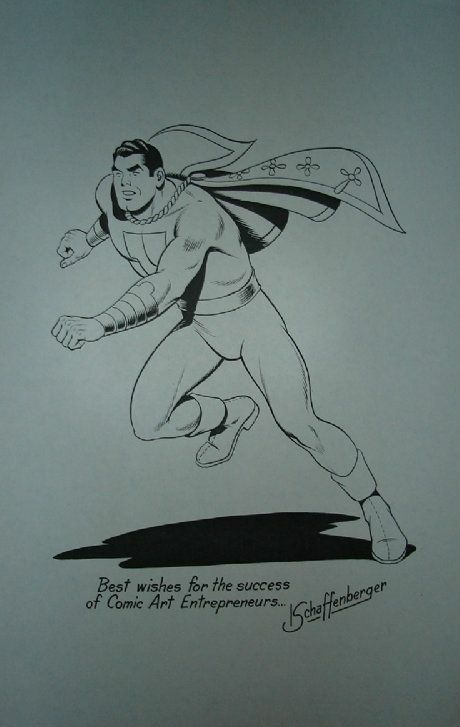 Mr. Schaffenberger began his career drawing Captain Marvel for Fawcett Comics as the Golden Age was drawing to a close, and then he went on to draw Lois Lane for DC Comics for many more years than he was associated with the good Captain. DC revived CM in Shazam! in late1972 and, before long, Mr. S was back drawing Captain Marvel for the first time in twenty years. Below is the wonderful page that Kurt Schaffenberger drew for me. So you feel Batman is a little on the grim side in the new Christopher Nolan film? You're wishing that things could lighten up just a little bit? Oh brother, have I got some news for you. Batman Burlesque is a new play opening tonight at The Gorilla Tango Theater in Skokie, Illinois and running through September 29. Maybe the publicity photo above makes it clear that the word "grim" will not be in anyone's mind when the actors take the stage. It appears that the cast is all female and high heels are de rigeur. It says here that admittance is (gulp) only for those aged eighteen and over. (I do wonder if this production has been in any way authorized or approved by DC Comics.) By the way, I haven't even revealed the full title of the play. You can read more about Batman Burlesque over here and here. Good luck. Back when I was building up my comics collection a few decades ago, I managed to rack up 85 of the 93 issues in the original run of Showcase. (I had every issue from number six onward except the ones featuring The Flash.) It was a fun series to collect and read Showcase because of how the focus changed every three issues or so (just as it did over in sister-series The Brave and the Bold after The Viking Prince sailed away but before the Batman team-ups swung in). All of the Showcase Flash stories I've long had in Archives or other reprint volumes, but I never ever got to see the stories that were printed in Showcase #1 (Firefighters) or #2 (Kings of the Wild) or #3 (Frogmen) or #5 (Manhunters). Never, that is, until last month! DC Comics has been publishing phonebook-sized reprints in black-and-white on newsprint for a while now. The series was dubbed "Showcase Presents..." in honor of the venerable Showcase comic book that I'm writing about above (and which, of course, ushered in the Silver Age of Comics when The Flash arrived in Showcase #4). Last month DC put out Showcase Presents Showcase, reprinting the first 21 issues of the Showcase comic book series. At long last I got to see the four early issues that I'd been curious about since the 1970s. It was nice to see some Joe Kubert art in Kings of the Wild, and do you know that the entire Frogmen issue was drawn by Russ Heath? I am very pleased with my purchase! 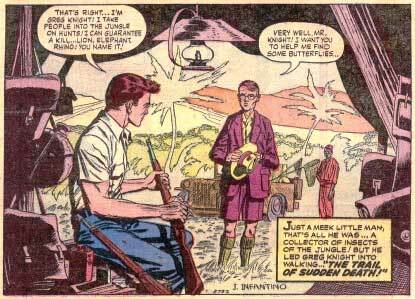 Nick Cardy drew some wonderful comics for us over the decades, didn't he? Maybe you'd like to take a look at some of his artwork over here, and I know you'll like to see his original covers to Aquaman #49 and From Beyond the Unknown #21 that I used to own. There's a gentleman who lives in my neighborhood whom I regularly see once per week. We say a cordial hello because his daughter was a student of mine ten years ago. I'm not quite friendly enough with him to ask if I can photograph his pants, however. Why would I want to? The gentleman I know was wearing his Nick Cardy pants again last week so I thought I would at long last tell you about them. I encourage you to visit the Nick Cardy website at www.NickCardy.com. I don't want to start any arguments! Please do notice that in the next sentence I write "my favorite" and not "the best." My favorite fanzine of all time is The Comic Reader, and The Buyer's Guide for Comic Fandom is my favorite newspaper about comics and Comics Scene is my favorite magazine about comics. Of those three favorites only one (The Comics Buyers Guide) is still published (and in a radically different form than its newspaper incarnation that I'm remembering). Rather than pine on about three greats that no longer exist though, I am on constant watch for something new that is as great or maybe even greater. I spotted Geek #1 on the newsstand last week. I hadn't heard that any such magazine would be coming down the pike but its Spider-Man cover leapt out at me off the rack. Although comic books are within the magazine's purview, they are not its top priority. Above the title on the cover is the list "Lifestyle + Tech + Music + Gadgets + Gaming + Movies + Comics" and it's a bit telling that comics are the last item in that queue. I might describe this publication as Esquire Magazine with a few pages about comics. The first issue has an article about some young comics artists like Amy Reeder and (Chicago resident) Mike Norton. The cover story about Spider-Man in the movies displays a number of postage-stamp sized comic cover reproductions. Another piece traces Catwoman in various media through the decades and it rightly mentions Darwyn Cooke's comic book interpretation from ten years ago quite favorably. I have a feeling that you've read between my lines and figured out that Geek is not supplanting Comics Scene as my favorite magazine about comics. You are correct. 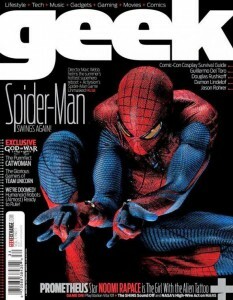 But there is some content worth viewing and I will be investigating future issues of, as it is called, Geek Magazine.